Liriodendron tulipifera L. was selected by the Floral Genome Project for identification of new genes related to floral diversity in basal angiosperms. A large, non-normalized cDNA library was constructed from premeiotic and meiotic floral buds and sequenced to generate a database of 9,531 high-quality expressed sequence tags. These sequences clustered into 6,520 unigenes, of which 5,251 were singletons, and 1,269 were in contigs. Homologs of genes regulating many aspects of flower development were identified, including those for organ identity and development, cell and tissue differentiation, and cell-cycle control. Almost 5% of the transcriptome consisted of homologs to known floral gene families. Homologs of most of the genes involved in cell-wall construction were also recovered. This provides a new opportunity for comparative studies in lignin biosynthesis, a trait of key importance in the evolution of land plants and in the utilization of fiber from economically important tree species, such as Liriodendron. Also of note is that 1,089 unigenes did not match any sequence in the public databases, including the complete genomes of Arabidopsis, rice, and Populus. 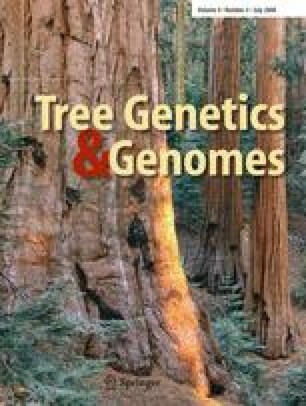 Some of these novel genes might be unique in basal angiosperm species and, when better characterized, may be informative for understanding the origins of diverged gene families. Thus, the Liriodendron expressed sequence tag database and library will help bridge our understanding of the mechanisms of flower initiation and development that are shared among basal angiosperms, eudicots, and monocots, and provide new opportunities for comparative analysis of gene families across angiosperm species. The online version of this article (doi: 10.1007/s11295-007-0120-2) contains supplementary material, which is available to authorized users. We thank David Oppenheimer and his lab for guidance on the in situ hybridization experiments. We thank the tree-improvement field crew at the University of Tennessee at Knoxville for collecting, freezing, and shipping the tissue samples used for RNA extraction. We thank Sheila Plock for assistance with manipulations and curation of the cDNA library, and Marlin Druckenmiller in the Schatz Center for Tree Molecular Genetics at Penn State for assistance in high throughput sequencing. The Floral Genome Project was supported by a grant to C. dePamphilis and co-PIs from the NSF Plant Genome Research Program (DBI-0115684). Dr. Liang was supported by a post-doctoral fellowship from The Schatz Center for Tree Molecular Genetics.